Long-lasting consequences: parallel lessons about antibiotic effects on the mouse gut microbiota and extreme weather events on graduate students. Antibiotics can change the gut microbiota, but how long can those changes last and how much can the effects reshape host health? Take a look inside a project that was sparked by a storm. Since the widespread incorporation of antibiotics into medical practice in the mid-twentieth century, these drugs have been seen as a modern miracle whose only downside is the development of antibiotic resistance (which, of course, is a major downside, but isn’t the focus of this post.) The consequences to patients have usually been considered minimal, and not worth worrying about. However, in the past decade, a body of literature has amassed showing that antibiotics may have a variety of unintended consequences, many more than previously appreciated. Epidemiological studies have linked antibiotic use in children to obesity, asthma, and inflammatory bowel disease (IBD), among other chronic conditions. Studies in both animals and humans suggest that antibiotics can disrupt the gut microbiota, and often these changes are durable. When I joined Martin Blaser’s lab at NYU School of Medicine as a graduate student, most of the work in the lab focused on antibiotics, the gut microbiota, and metabolism. Laurie Cox was nearing the end of her PhD where she discovered that low dose antibiotics given to young mice drove excessive weight gain (Cell 2014) and Victoria Ruiz had just joined the lab as a postdoctoral researcher to investigate immune changes in mice also given antibiotics early in life (Nature Communications 2017). On October 29, 2012 I was awaiting the arrival of mice that would mark the beginning of my first experiments for my graduate thesis work: my very own project on antibiotics and host metabolism. But that night, rather than making sure my mice were comfortable and organized in the animal facility, my fellow graduate students and I were helping with an emergency evacuation of the medical center. That was the night that Hurricane Sandy hit NYC and caused severe damage to NYU Langone Medical Center, the home of NYU School of Medicine. A tidal wave of water came up the East River and flooded First Avenue; an explosion at a Con Edison plant cut off the power to most of Manhattan south of 39th street. NYU Langone Medical Center was plunged into darkness and the basements were flooding. Hurricane Sandy. (Left) The East River near First Avenue at the beginning of the storm. (Middle, right) Relatively minor storm damage the day after Sandy. The evacuation of patients was successful, and I was thankful that as a student, and not a trained medical professional, I was able to help; but for us in the lab, the consequences of the storm were felt for years afterward. The Blaser lab was displaced for a year, and our animal facilities were reduced to about 30% capacity of what they had been. I spent that year bicycling around NYC to get to the various sites our lab had been temporarily rehomed, labs that lent us storage space, and the locations of my graduate classes. As a brand new graduate student in the Blaser lab, I was back to figuring out a project—with a new set of technical challenges. While looking for inspiration, I joined Dr. Blaser at a conference up the street at Rockefeller University. Balfour Sartor was a guest speaker, and a discussion between the three of us after his talk led to the project published in Nature Microbiology today. We were fortunate that everywhere we turned, there were colleagues ready to help us however they could— with freezer storage, bench space, or a new collaboration. The Blaser Lab. Keeping up the teamwork before Hurricane Sandy and during recovery while we were housed in various academic centers around town. With help from Balfour Sartor and the National Gnotobiotic Rodent Resource Center at UNC School of Medicine, we inoculated pregnant germ-free IL10-/- and wild-type mice with gut microbiota harvested from either control mice or mice given low dose antibiotics from Laurie’s prior studies. We showed that pups born to mothers given the antibiotic-perturbed microbiota had more instability and heterogeneity in their gut microbiota. Most importantly, in the IL10-/- mice, the antibiotic-perturbed gut microbiota led to accelerated onset of IBD pathology. These findings could have substantial implications for human health and medical practice. In these genetically susceptible mice, an antibiotic-perturbed microbiota that was inherited from a previous generation was sufficient to accelerate disease. This suggests antibiotic exposure has longer-lasting consequences than previously believed, with the ability to transcend generations, thus impacting the health of individuals without direct exposure. This may be important to guide physicians in prescribing antibiotics more cautiously to help protect future generations of children. Of the many lessons I learned in graduate school, perhaps the most persistent was this: never underestimate the impact that a single event might have on your life—from an unexpected storm to a course of antibiotics. Enjoying Being Home. 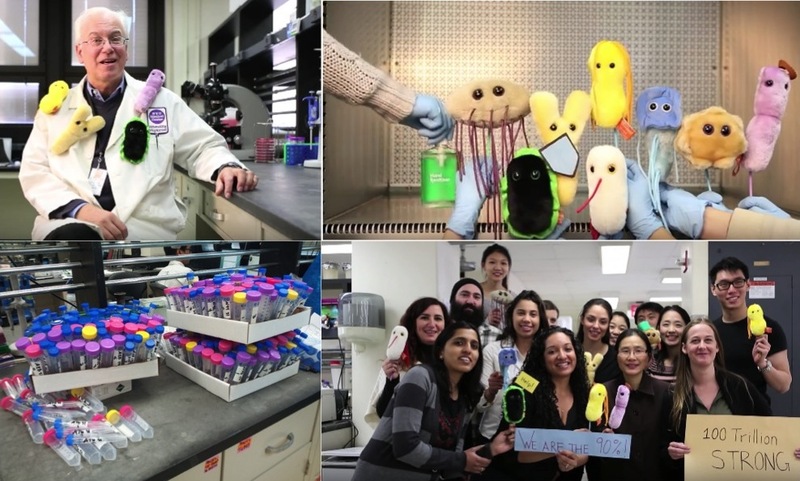 The Blaser lab making a short video, "Save the Microbes," soon after we moved back in to our home lab.